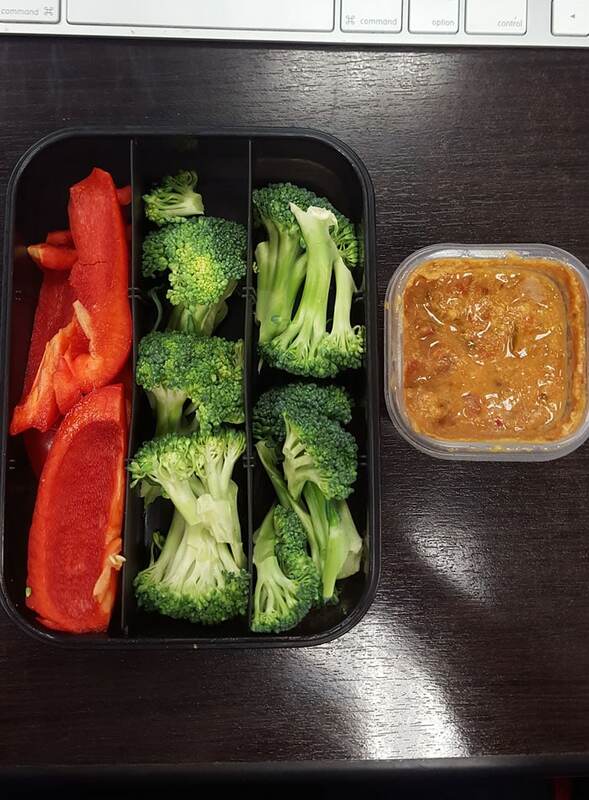 I just finished up 12 weeks of vegan flexible dieting with flying colours and after a week or so off tracking I’m starting up again with new goals for the next 6 weeks. It was nice not to worry about it for a while, I still ate normally and healthy but didn’t measure or track anything. Honestly after 12 weeks, I’m so good at eyeballing and estimating, I pretty much stuck to it without measuring anyways. I’m really happy with what I achieved in the last 12 weeks. I didn’t lose much in terms of bodyweight but the shape and composition of my body completely changed and my goal of improved athletic performance was definitely reached. Training has been feeling awesome, like the last 2.5 years of work is all coming together. Strict HSPU are coming along, I PR’d my clean, snatching feels great, pull-ups actually feel good, I did a 30 lb. weighted strict pull-up, running feels amazing, box jumps and kipping HSPU feel great, I might even go as far as burpees feel easier! (Don’t tell anyone I said that…). My goal was always to improve performance and I feel like I’ve already achieved that, so regardless of the aesthetic changes, I’m very happy and proud of the progress I’ve made. 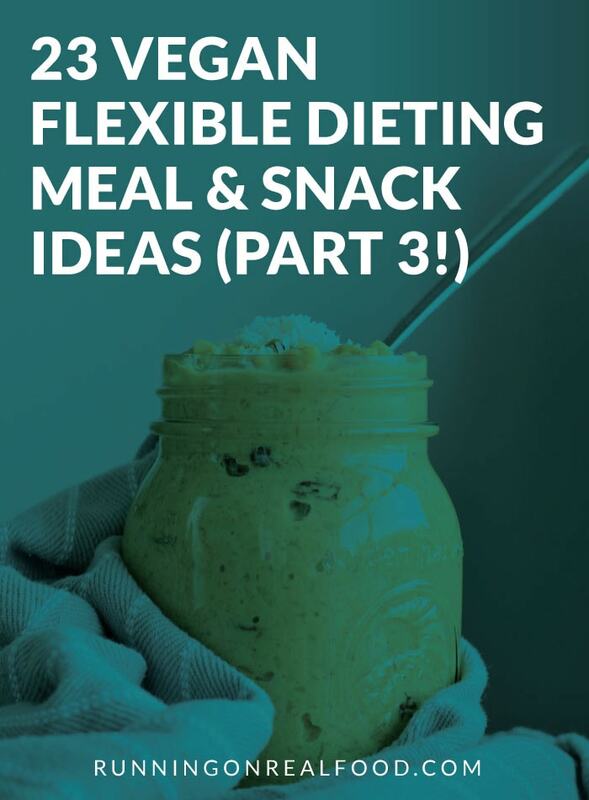 I’ve already shared a number of posts on the topic of vegan flexible dieting for athletic performance, so be sure to have a look at those for more meal and snack ideas! 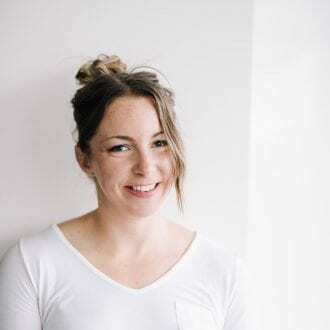 This list is what I’ve been enjoying recently, here’s Part 1 and Part 2 of other macro-friendly vegan foods, my favourites are always changing so I’ve been updating you with ideas and discoveries as I go! Frozen cherries are one of my favourite desserts or snacks as of late. They don’t freeze completely solid so they’re just the perfect sweet and satisfying treat. Not only that, cherries are high in antioxidants and have anti-inflammatory properties. Try them as a treat after a hard workout to get that recovery process going. They’re also awesome if you let them thaw in the fridge first then enjoy them as is or use them as a topping for oatmeal or protein pancakes! I also love making protein pudding with Vega Performance Protein in Vanilla and stirring in chopped frozen cherries. Amazing. I’ve been making this dish weekly for sometime now. I love how quick and easy it is and the macros are so low you can enjoy a huge, satisfying portion. I like to top with plenty of nutritional yeast for an extra boost of protein and B12. For more protein, stir in crumbled tempeh, baked tofu, Field Roast Vegan Sausage or lentils. 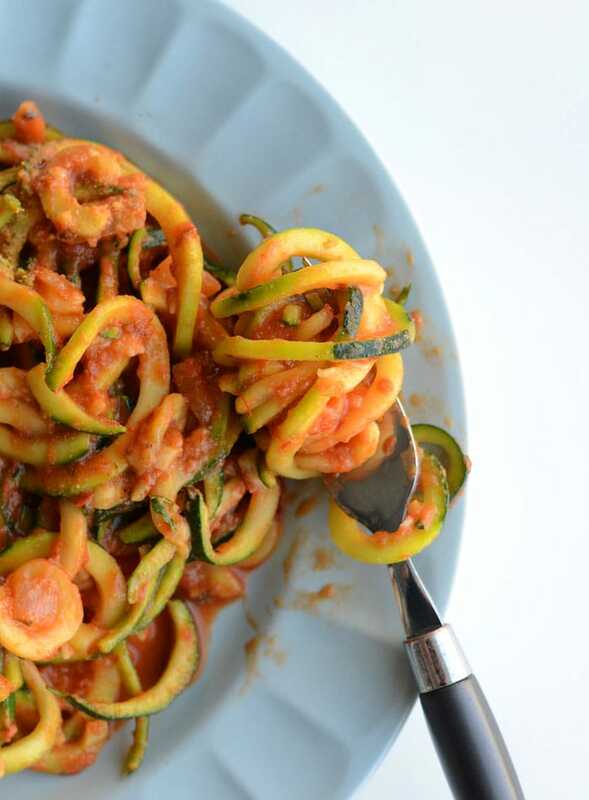 To make it simply saute some zucchini noodles with garlic and onion, add your favourite marinara sauce and dig in! If you plan on giving flexible dieting a try, or just enjoy healthy eating, you need a spiralizer! Buy one here. It’s the most used tool in my kitchen and I couldn’t’ live without it. 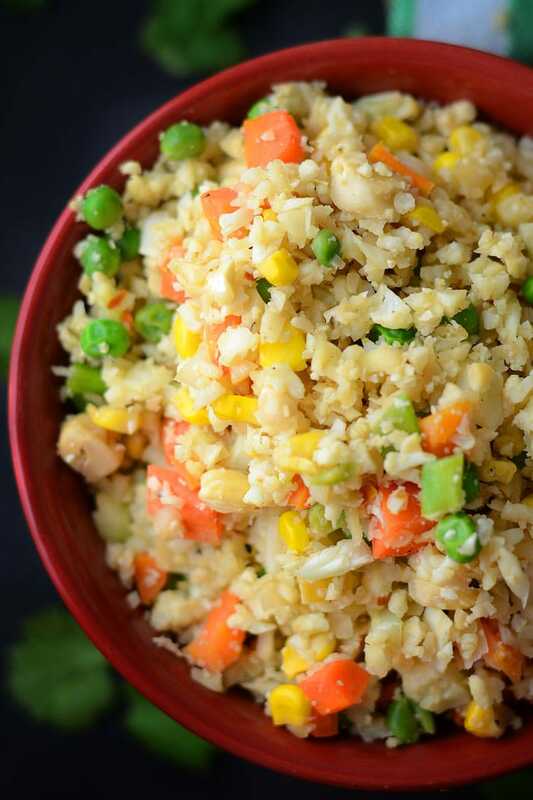 I love my recipe for Healthy Vegan Cauliflower Fried Rice. 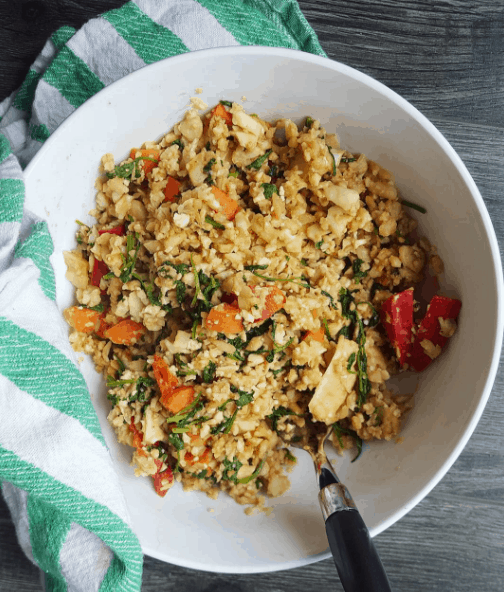 It’s so quick and easy to make, especially if you prep a big batch of cauliflower rice on the weekend! It’s very low in macros too, so you can enjoy a nice, big, satisfying portion. Top with tofu, chickpeas, tempeh or edamame to increase the protein content. Get yourself a julienne peeler, you can buy one here for about $10. I use this handy little kitchen tool all the time. My favourite use for it is to make carrot slaw. 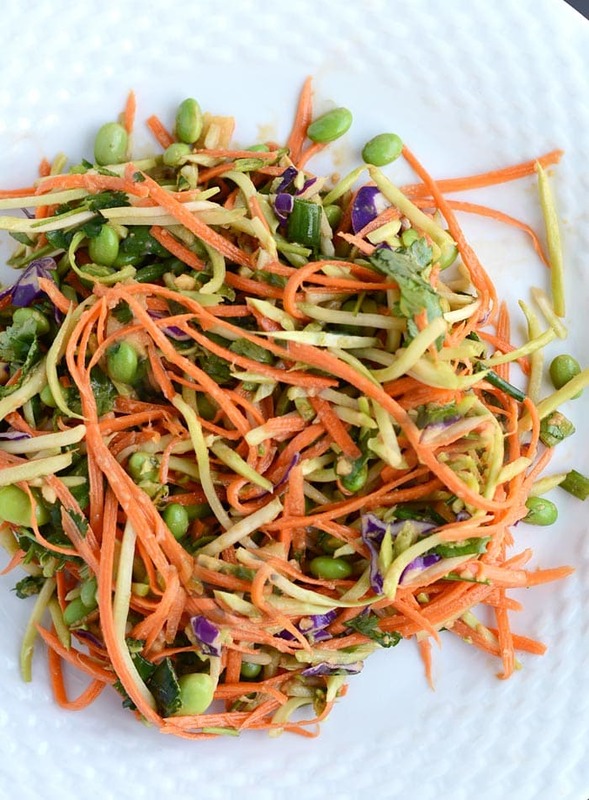 Simply use the peeler to make a big salad with the julieened carrot. This is a great high-volume, nutrient dense food you can enjoy for very low macros. 5. 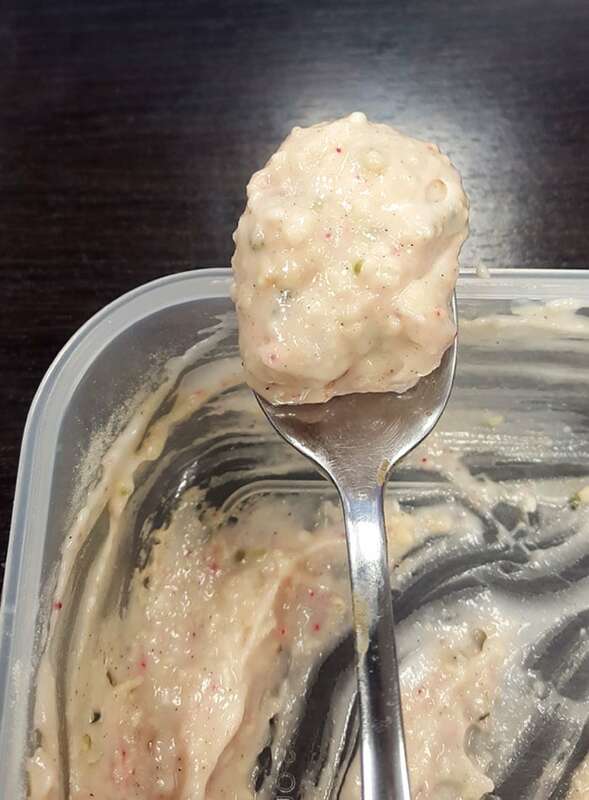 Cauliflower rice protein pudding. You may or may not be into this one but I’m in love. If you’ve read the other posts in this series and follow me on social media, you’ll know I’m all about that high-volume life ie. how much can I eat for the lowest amount of macros. That means I use cauliflower a lot to replace ingredients like oats and rice. To make it, simply cook cauliflower rice in a saucepan with almond milk, stevia, raisins and cinnamon until soft. I also like to add coconut and Vega Vanilla Performance Protein. 6. Low fat peanut cauliflower rice bowls. I love this for a 10 minute lunch or dinner. Simply add rice cauliflower, P2B, soy sauce, garlic powder and whatever chopped veggies you want to a pan, cook it all up and dig in! I like to top it with sriracha and cilantro when I’m done and if I have the macros, some chopped cashews. Having tofu scrambles for breakfast instead of my usual protein oats allows me to save those carbs for something else later in the day. 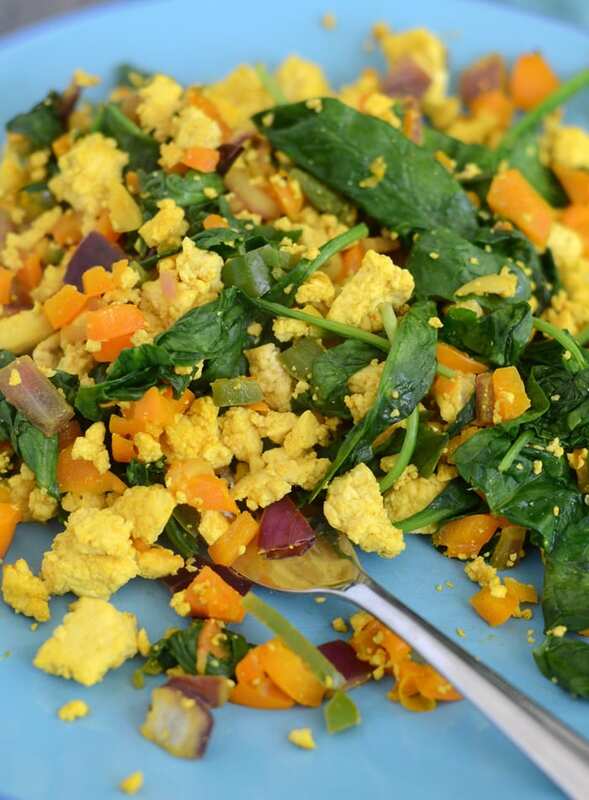 I love oats and eat them most days but tofu scrambles are a great way to sneak extra veggies into your diet and start your day with filling, high-protein meal. Plus they’re delicious, easy to make, customizable to whatever you have on hand and work great for food prep. I love making a big batch of this on the weekends to have as a snack during the week. It’s a great way to add protein to salads and other dishes but also works great as a quick snack on it’s own. 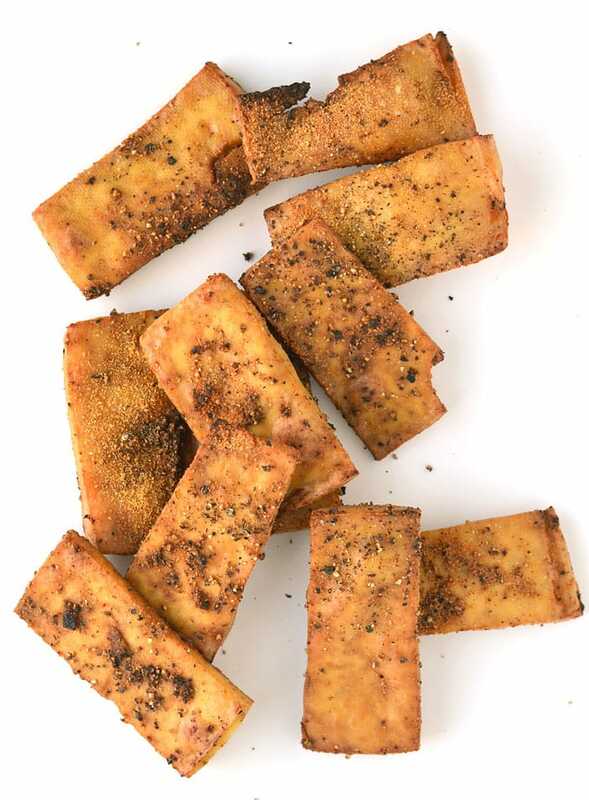 I also like this recipe for BBQ Baked Tofu as a snack. Yep, cauliflower rice again. Get used to it. I love it. I’ve been enjoying a sweet and savoury Indian-spiced dish recently that’s really good. 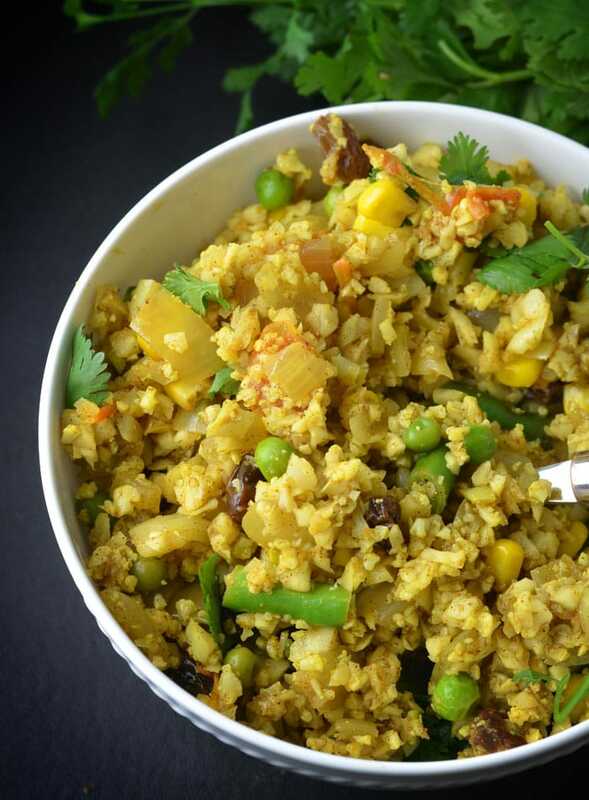 Add riced cauliflower to a pan with onion, garlic, ginger, cinnamon, cumin, curry powder, peas, diced tomato, raisins and some vegetable broth, fry it all up and dig in! 10. Rice cakes with vegan cheese. Kinda weird, kinda in love. 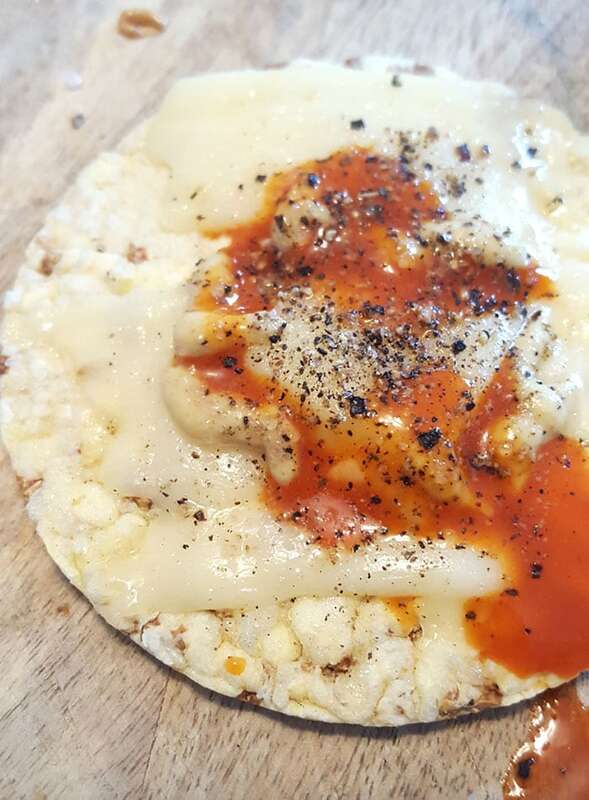 Get yourself some organic rice cakes, top with Earth Balance Vegan Provolone, melt in the oven, douse with hot sauce, dijon mustard and black pepper. Enjoy. 11. Mexican cauliflower rice stuffed peppers. Noticing a theme, here? I eat a lot of cauliflower rice. The volume is too good to pass up. You can eat 3 or 4 of these amazing stuffed peppers and barely put a dent in your daily macros. A few times now, I’ve eaten 2 for lunch then had 2 as a snack later in the day. To make them, mix cauliflower rice with onion, garlic, cumin, paprika, chili powder, salsa, corn, salt, pepper, lime juice, cilantro and black beans then stuff the mixture into the peppers. Bake in the oven, covered for approximately 30 minutes. Macro-friendly healthy fries! 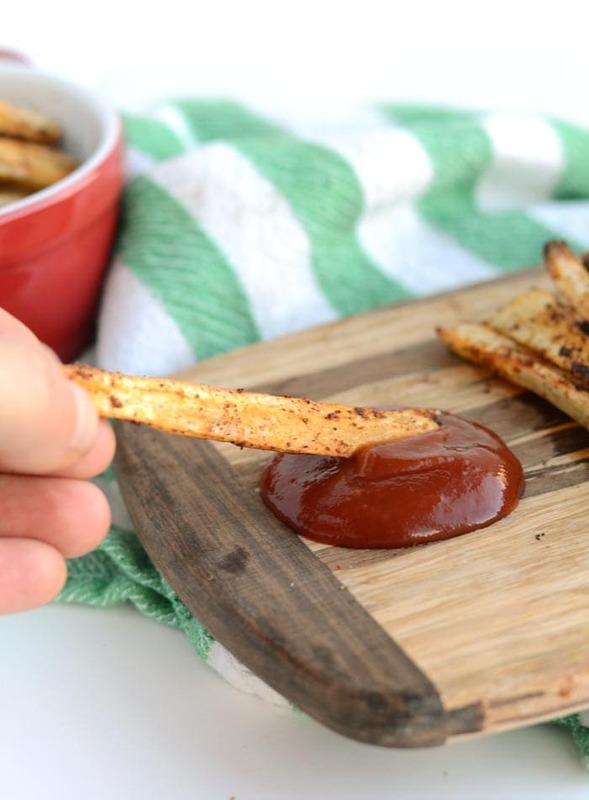 Get the recipe: Chili Garlic Baked Parsnip Fries. Another delicous, high-volume, nutrient-dense food. 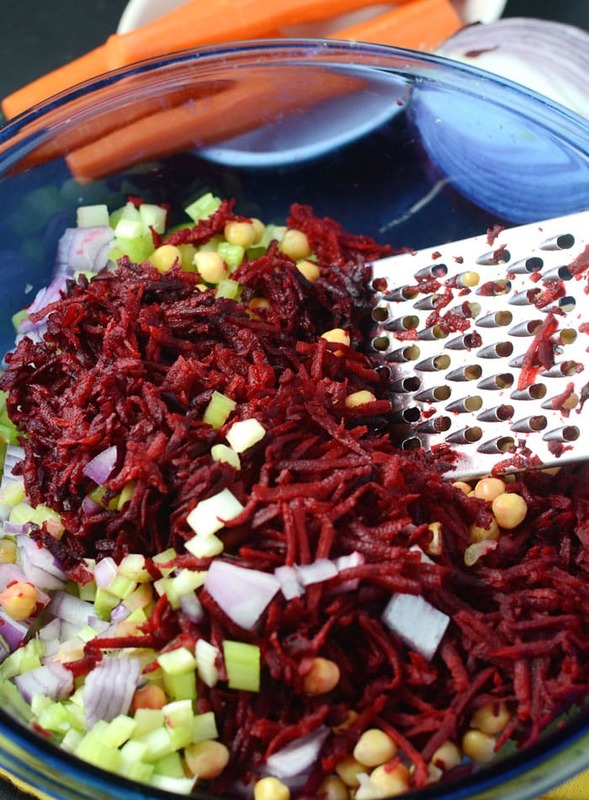 Simply grate raw beets and use them as a base for big, healthy salads like my Raw Beet Salad with Chickpeas. 15. 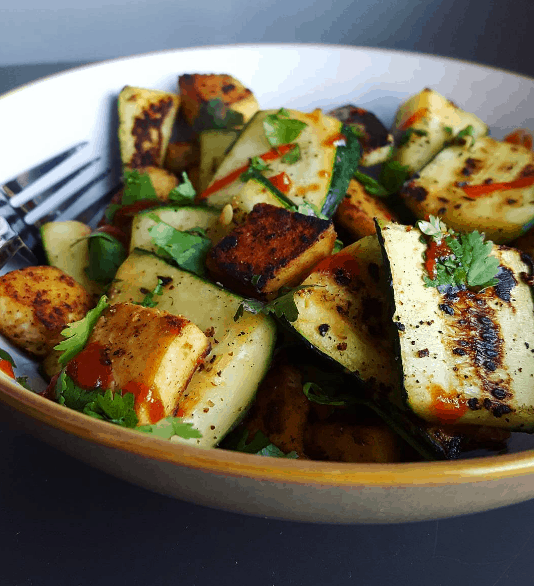 Garlic zucchini and tofu. Zucchini is another food I eat daily. I often eat it raw, or made into noodles but lately I’ve been loving it sautéed in a pan with lots of garlic powder, cilantro, black pepper and tofu. Cook in the pan, adding a little water as needed until the zucchini and tofu is nicely browned. 16. Radishes with salt and pepper. There’s not much to explain here. Radishes are another delicious, healthy, high volume food you can enjoy as a snack. Slice them thinly and top with fresh ground black pepper and sea salt. It’s so good! You can add a little hummus too if you like! I’ve been loving this for breakfast on the weekends. 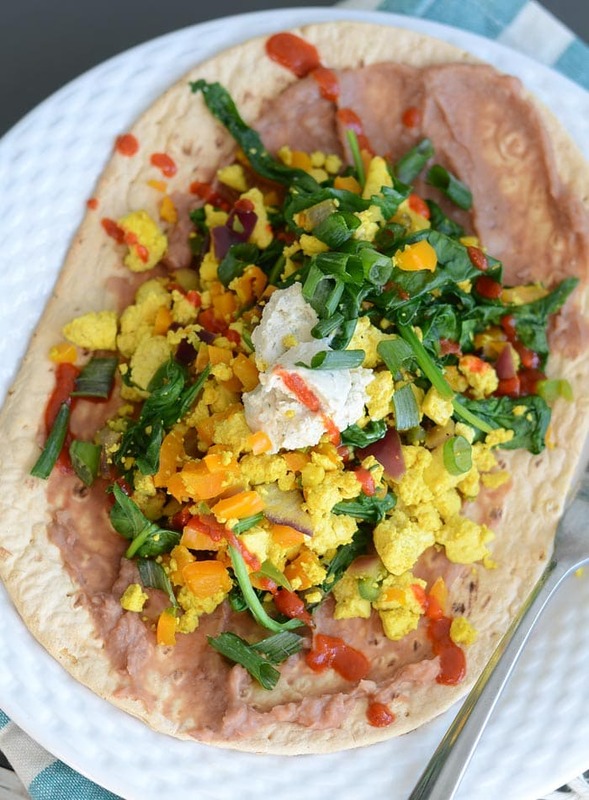 Toast up a Flat Out Flat Bread, spread with refried beans, top with tofu scramble and salsa. It’s amazing. 18. Bulletproof banana protein coffee. Make coffee, blend with Vega Vanilla Performance Protein, MCT oil and frozen banana. Die and go to heaven. And have more energy than you know what to do with. Best enjoyed pre-workout. 19. 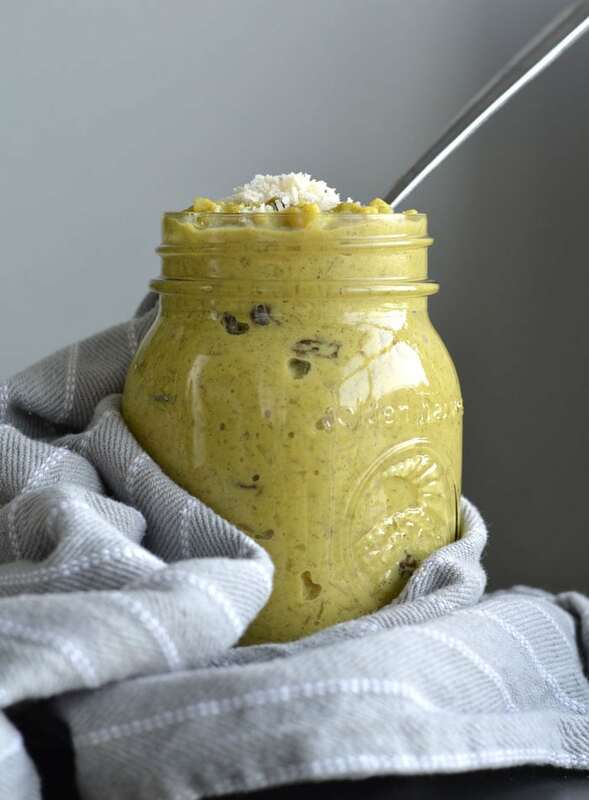 Cookie dough overnight oats. This has been my favourite breakfast for weeks now. It’s simply overnight oats made with Vega Performance Protein in Mocha, Berry, Chocolate or Vanilla made super thick so it’s like cookie dough. You can make it with almond milk or water and then add in whatever you like. My favourite thing to add is unsweetened shredded coconut with the vanilla or berry protein. So good. If I can eat dessert for breakfast, I will. 20. 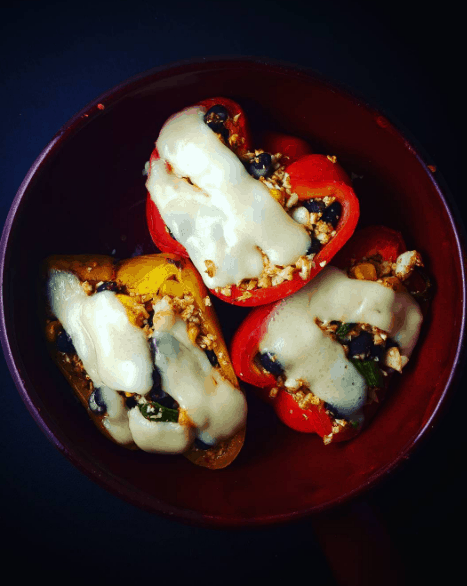 Hummus stuffed baby bell peppers. 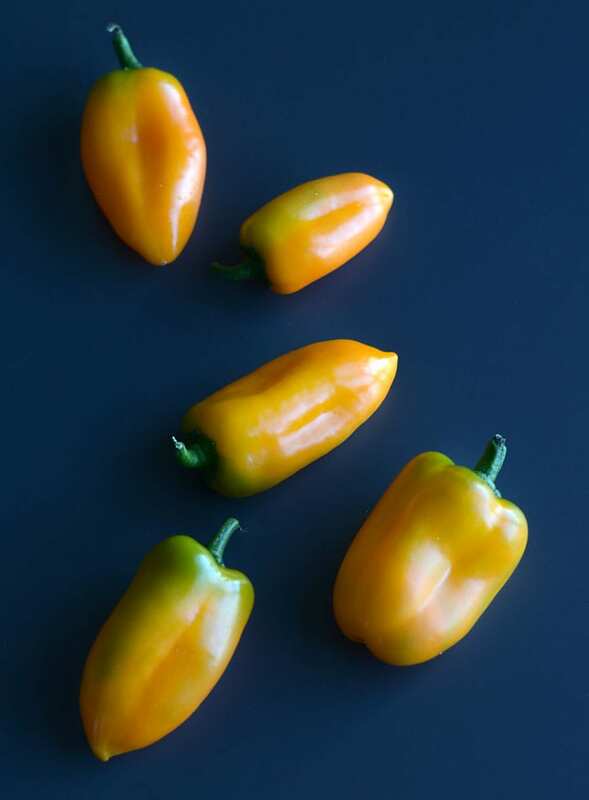 I’ve been going through a big bag of baby bell peppers every week lately. They’re so good! They’re sweet and crunchy and so good for you. I often eat them on their own as a quick snack on-the-go but if you want something more substantial, try stuffing them with homemade hummus. Delicious. 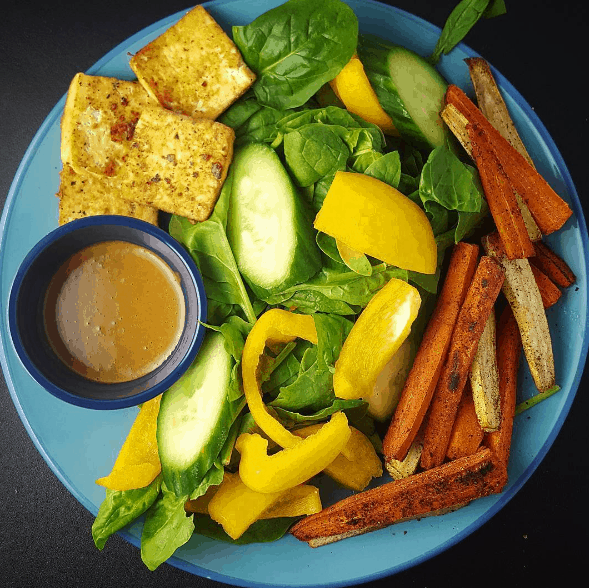 My recent favourites have been dijon mustard mixed with Frank’s Buffalo Sauce and a few drops of stevia and salsa mixed with nutritional yeast. 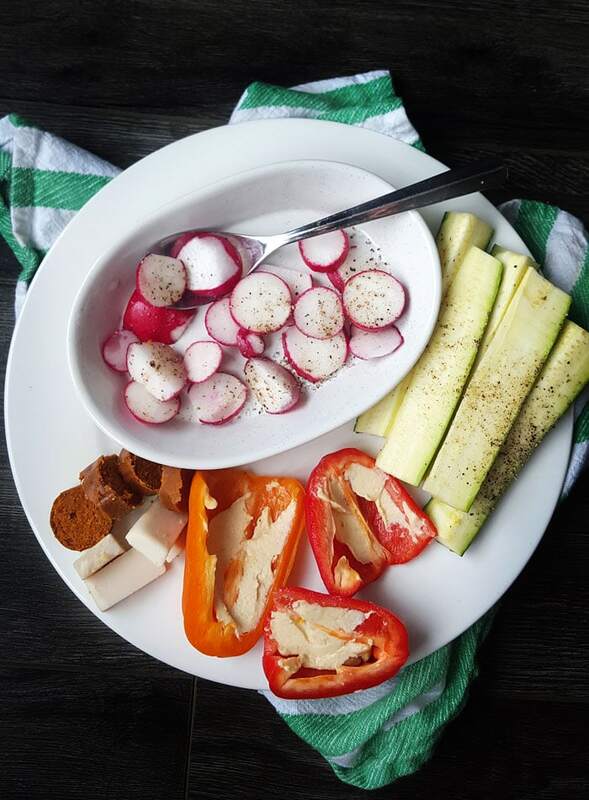 I love raw veggies and eat a tone of them everyday but if you need a little help eating them, a yummy dip is a great place to start! Avoid store-bought dips and make your own at home. There are so many options. I also like making a dip with soft tofu, lemon, apple cider vinegar, salt, pepper and lots of fresh herbs. 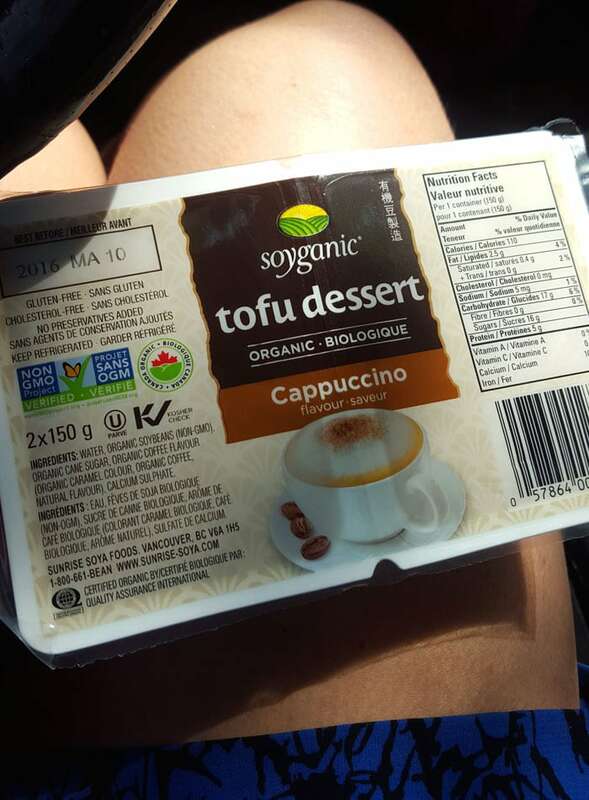 I love this for a high-protein dessert or snack. Mix in my Sugar-Free Cinnamon Raisin Granola for extra yum! This is amazing with the berry flavoured Vega Performance Protein, mix it with So Good Cultured Coconut Yogurt. It’s the best thing ever. I’m overwhelmed by this post! I want to try everything!! You’ve given me tons of inspiration, thank you! Haha, I’m glad you found it helpful and I hope it’s not too overwhelming! I make it hot. I just use a small piece of frozen banana, so it doesn’t cool down the coffee. 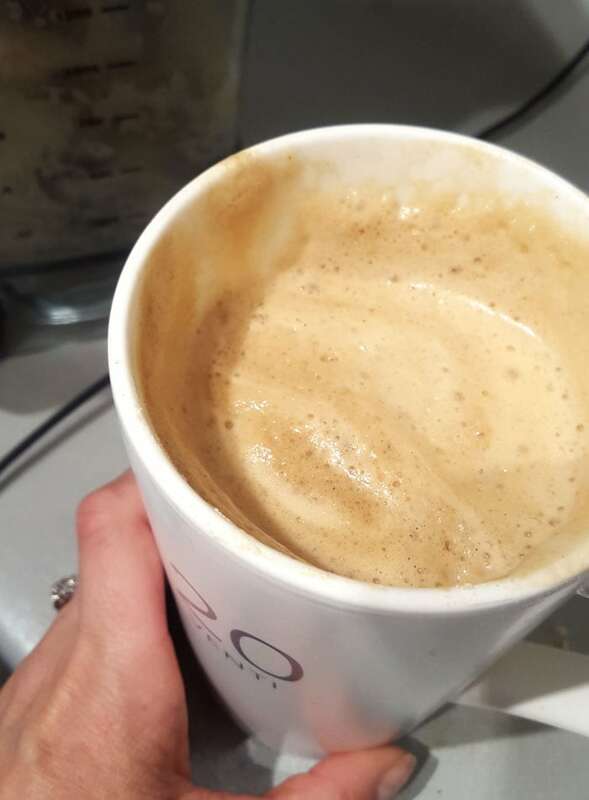 It’s not super thick but rather frothy like a latte! Hello, Thanq for sharing so many vegan flexible dieting meal and snack ideas. All are yummy and healthy. I must try everything. Really all dishes described here are beneficial to dieting plan and also tasty. Taste and health all balanced here. So many dishes so that one can never be bored while trying. Hey Deryn! I LOVE this post. SO many great ideas. 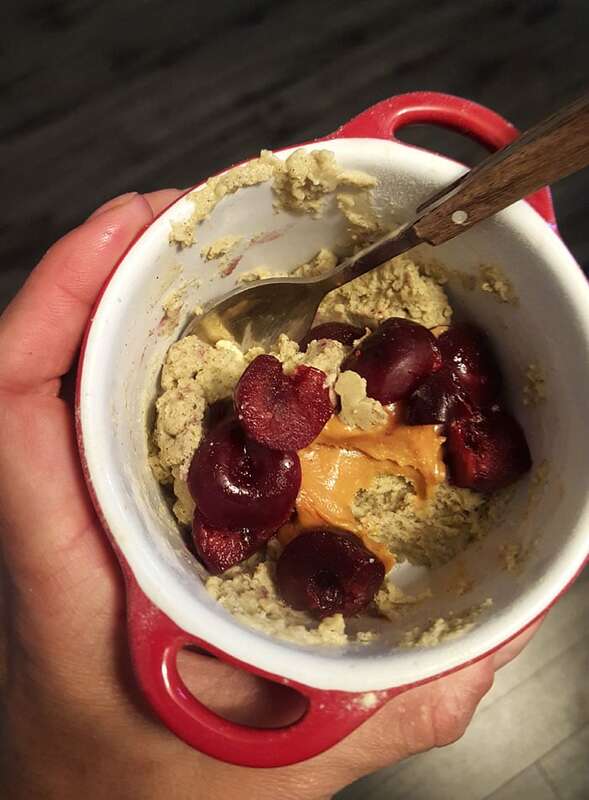 Question about the first thing… the cherries (LOVE love love frozen cherries) – what do you use to make your protein pudding? Vega vanilla… water? almond milk? did I see some kind of nut butter in the pic? 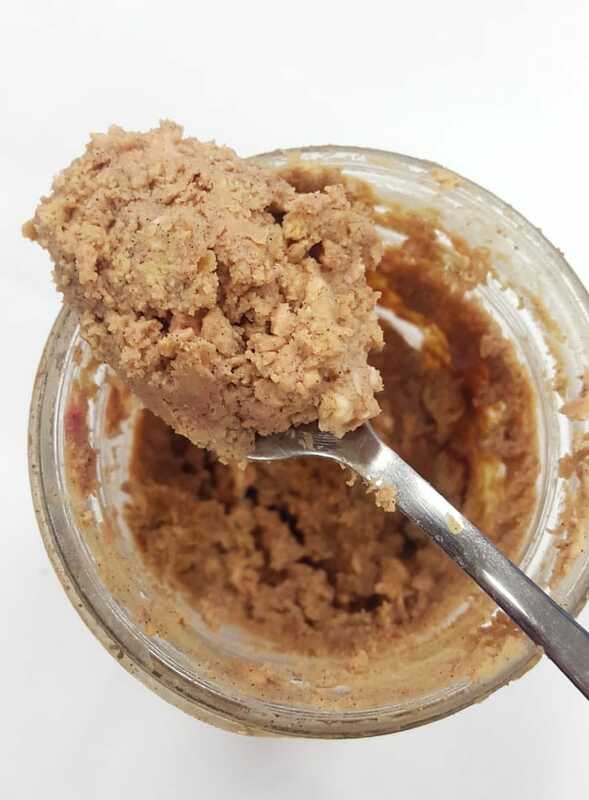 Hi Andrea, yep, just protein and water usually…I’ll add some nut butter if I have fats or I”ll sometimes have P2B if I don’t have fats and I want something peanut buttery…pumpkin and protein is also delicious, applesauce and protein is good too..take a look through Part 1 and Part 2 for more ideas! I wish you would write a weekly sample meal plan! I’m having such a hard time organizing all of the recipes into perfect macro proportions. ???? Thank you for all the great ideas though! You’re welcome! You’ll figure it out with a little practice, no problem. Good luck!